It appears that America's Christians got duped again by another phony. 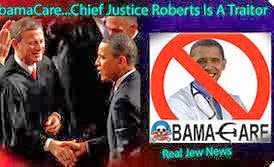 Sometimes it's a phony Evangelical preacher (John Hagee), sometimes a phony right-wing politician (George Bush), this time it's a phony conservative Chief Justice, the dishonorable John Roberts. It looks like it turns out Justice Roberts was a plant all along and belongs to one of those demonic secret societies, The Knights of Malta, that are conspiring to establish the NEW WORLD ORDER.